Barry M is my favourite nail polish brand, I haven’t really explored into their cosmetics until I saw the release of the Gelly Hi Shine Lips which I knew I needed to try! Lip crayon style products really catch my eye, and the colour selection for the Gelly Hi Shine Lips where all my type of colour. 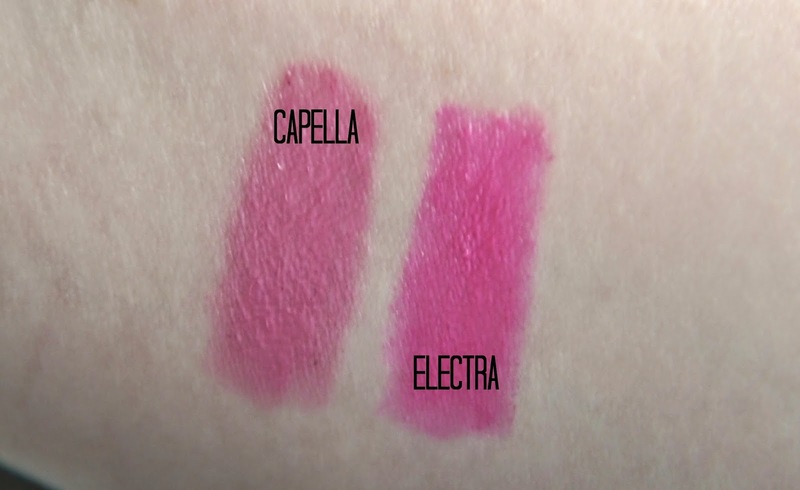 I decided just to pick up two to give them a try, Capella (a blue toned wearable pink) and Electra (as the name suggests, an electric pink). I really love these, they’re super glossy on the lips without being too sticky, really easy to wear and long lasting, especially Electra which leaves a stain on the lips. I find them really easy to apply, and don’t tug or pull. Electra has a raspberry type of smell to it, Capella has the slight smell of play doh in it, but its not unbearably strong. The packaging is simple yet pretty, and I find they look really nice in my make up collection. They’re not as chunky as other crayon style lips products- Revlon ColorBurst I’m talking to you. For only £4.99 I can’t fault them, and if you look out they’re always on offer in Boots and Superdrug. I’m going to end up getting the rest of them soon!